Now go to the "Torrent Search" tab. In "send .torrent files to" drop down menu you can change where torrents will be sent. Deluge password - your seedbox password. It's up to you how to fill in the rest of the fields. Now click on 1 "Test Connection" button. If you get "Success" message, click on 2 "Save changes" button, otherwise please check if you configured everything properly. Transmission username and password - your seedbox username and password. Now click on 1 "Test Connection" button. If you get "Success" mesage, click on 2 "Save changes" button, otherwise please check if you configured everything properly. 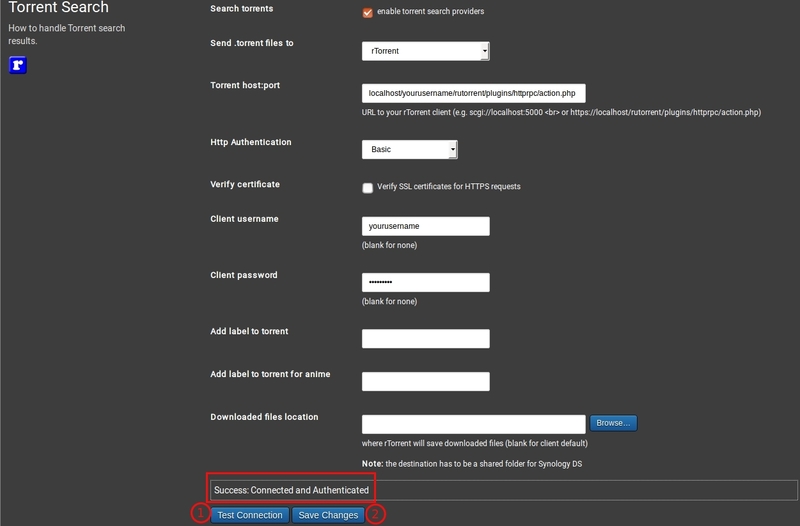 rTorrent username and password - your seedbox login details. NOTE: If you are getting an error after "Test connection" please just click "Save changes". Test connection should work after the configuration is saved.